Regular size bath towels not big enough for you? XL bath towels don't cut it either? Well, the Magnificence Bath Sheet just may fit the bill. Feel like royalty with this 35" x 70" bath sheet: Larger than a regular bath towel and larger than an XL bath towel. 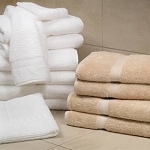 High quality towel--largest size, very soft and absorbent. Available in White and Natural Linen. These are the ONLY bath towels still made in the USA! From 1888 Mills in Griffin, GA. Towels are available separately and we have also put together two different complete sets, the Elite Towel Set and the Deluxe Towel Set. Two colors available: Natural Linen and White. Natural Linen is a very light tan--see pictures. Quantity discounts available for 4 or more of a particular style. Please call first! Note: These towels cannot be purchased directly from the manufacturer. Customers must go through authorized retailers, like Strictly USA. I've gotten quite a few of these towels, wash cloths, and bath mats. They've all lasted wonderfully and are still going strong over a year later. This bath sheet is a new addition for our other new addition, a very muddy Husky pup. Just like everything else magnificence, it's of an excellent quality with virtually nothing left behind in our dryer. 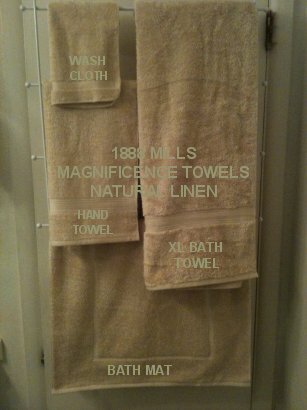 Purchased 1888 Mills bath sheets. Very pleased with the quality and size. The best part of the deal, made in U.S.A.. I would recommend purchasing these towels.